My intention in this series was to make at least one group of modern vessel shapes. These were inspired by the colours and colour combinations of modern work in The Art Store and the many varied vessels within the Roman section of the museum https://www.thecollectionmuseum.com . This resulted in the theme of ‘Trade’ as a series of work. The wide range of ceramic styles, their sheer number, many cultures and the period they cover was overwhelming. I noted several patterns and shapes and after much though felt that currency symbols would be symbolic in the current time. 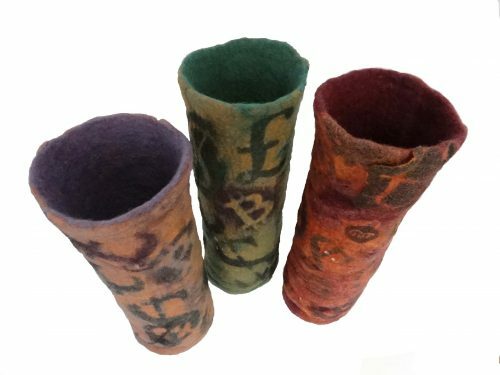 Trade 1-3 includes stencilled symbols, and multiple layers of pre-felted wool and at least three feltings. Trade 1, purple- 35(h) x 11(w) cm, Trade 2, – green, 38(h) x 11(w) cm and Trade 3, orange – 37(h) x 11(w) cm.